It’s time for a seasonal changing of the guard. With May just around the corner, many of Greater Cincinnati’s purveyors of cultural entertainment are wrapping up either their current undertakings or their season. That’s good news for you: There’s plenty to catch, both coming and going. MusicNOW has grown a lot since Bryce Dessner of The National founded it in 2006. The festival was created to give audiences a chance to hear, as the website says, “contemporary musicians and risk-taking artists who do not fit neatly into genre defined categories,” and that they did. The festival over the years has included sold out shows with the Cincinnati Symphony and performances is disparate venues around the city. Friday’s 8 p.m. opening night celebration is at the Masonic Center (next door to the Taft Theater; 317 East Fifth St., Cincinnati, OH 45202). Saturday’s and Sunday’s headline performances are at the Freedom Center (50 East Freedom Way, Cincinnati, Ohio 45202). Check the website (above) for the full schedule. If you still think Cincinnati is behind the curve artistically, take in a few of these performances and be impressed. It’s not officially a MusicNOW event, but, if this were network television, it would be billed as a special crossover event. The ballet’s annual collaboration of the new features choreography by Justin Peck, Jennifer Archibald and Kate Weare set to music by composers including … here it comes … Bryce Dessner and other works performed live by Eighth Blackbird. Better call now; two shows already have been added – there are now five – to meet demand. All are in the Aronoff Center’s Procter & Gamble Hall. Learn more about Jennifer Archibald via our April cover story. Ariel Quartet: Spring series finale – The College-Conservatory of Music’s quartet-in-residence rescheduled its Jan. 30 performance for this week. Find out what they’ve been up to in the meantime with this evening of Bartok, Brahms, Schumann and John Cage’s “Five,” featuring Allen Otte, percussionist and CCM emeritus faculty member. Thursday, April 27, 7:30 p.m., in CCM’s Corbett Auditorium (2600 Clifton Ave., Cincinnati, OH 45221; 513-556-4183). Catacoustic Consort: “Chiaroscuro” – Catacoustic joins forces with Asheville Baroque for this concert of virtuoso viola da gamba duos with harpsichord from 18th-century Germany. Friday, April 27, 7:30 p.m., at Prince of Peace Lutheran Church (1528 Race St., Cincinnati, OH 45202; 513-772-3242). Cincinnati Camerata: “Songs of the Isles” – Camerata celebrates the music and poetry of the British Isles, including works by Ralph Vaughan Williams, Stephen Paulus, Jonathan Willcocks, John Wilbye and Williametta Spencer. Music director Jason Harris makes his debut. Silent auction fundraiser follows, but you’re not obliged to bid just by going to the concert. On the other hand, perhaps you’ll be inspired to do so…? Sunday, April 29, 4 p.m., at the Irish Heritage Center of Greater Cincinnati (3905 Eastern Ave., Cincinnati, OH 45226). It’s just two weeks until the Museum Center’s Children’s Museum reopens. Until the big day, though, the center’s programs have had to move to alternate venues. That’s a natural for the Heritage Program’s 2018 tours. This weekend, Stanley Hedeen, Xavier University professor emeritus, talks about the history of the 28-mile waterway the natives called the Maketewah and that came to be known as the Mill Creek. Through the last two centuries, it was found as a pristine watershed, became an industrial dump and is now being reclaimed as a natural resource. Note: Reservations must be made by today, April 25. Also, because of the terrain, the tour is not handicap accessible. 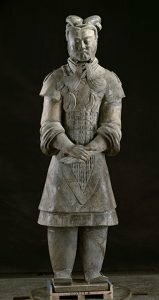 As befits the scale of its namesake exhibit, the art museum is taking the Terracotta Army edition of its Art After Dark party series up a notch. There will be live music from GE APAF Music Ensemble, special performances from the Chinese Chamber of Commerce, food from Oriental Wok and, of course, Listerman Brewing Co.’s special brew, Terracotta Army NE Style Red IPA. Be warned: Only the first 600 will get admission to the exhibit.